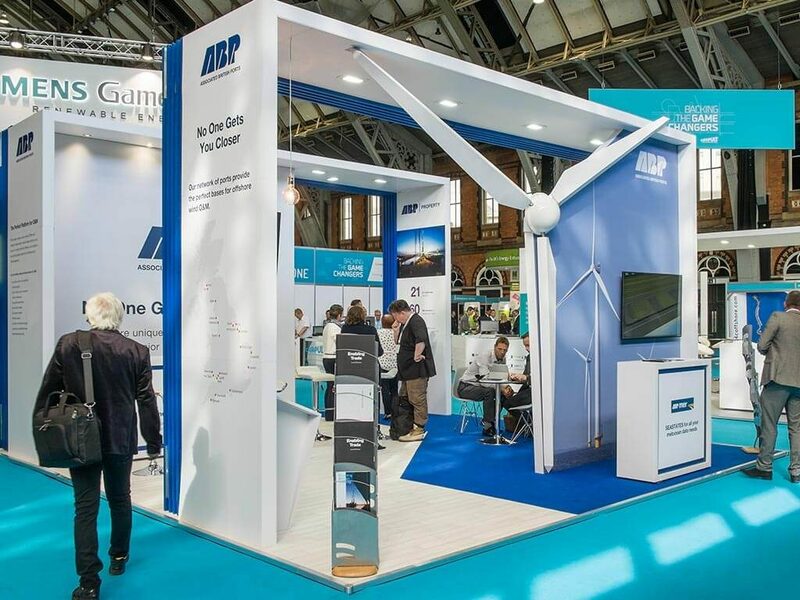 The UK’s largest port group, ABP, wanted to educate and promote their business at two key shows; Multimodal and Global Offshore Wind. With primary objectives of lead generation and attracting & engaging visitors, ABP wanted to measure success with tangible results. 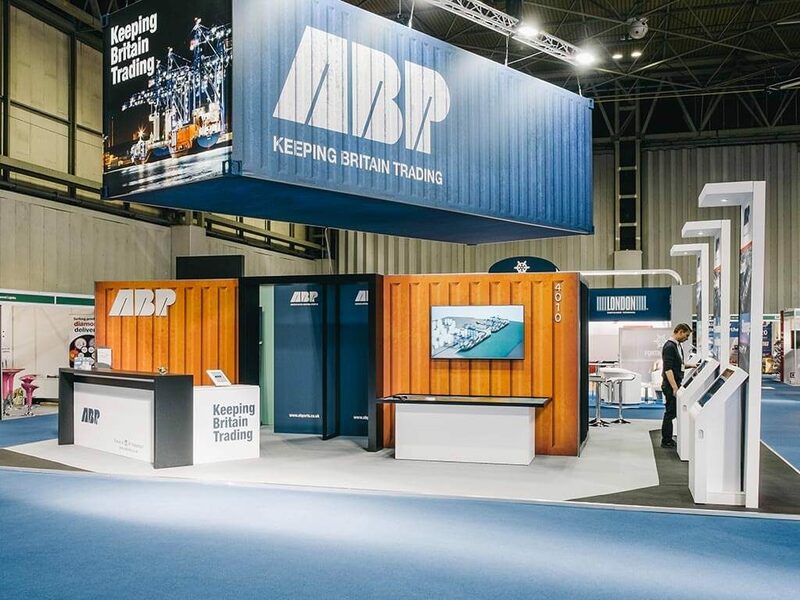 Multimodal showcases freight, logistics and supply chain management and ABP wanted to showcase their three business areas of ports, rail and property. They had a focus on promoting their container terminal with newly increased capacity. Global Offshore Wind was used to showcase their offshore capabilities including an East of England Energy Hub. With two very different audiences, one a wide range of companies involved in transport and logistics, and the other a specialised segment of windfarm operators and suppliers. For Multimodal, Nimlok designed a 6m high container with lightboxes on each end to attract attention of visitors from across the hall. Three media centres were installed with company literature and data capture to showcase the three business areas. ABP also used their training partners simulator as an additional interactive touchpoint. For engagement, an interactive proximity table with reverse RFID technology allowed visitors to move a puck around a map of ABP location hotspots. When placed over a hotspot, varied personalised content was played on the screen, displaying information on each location. At Global Offshore Wind, Nimlok used a bespoke 4.4m high wind turbine blade to both attract visitors and promote their offshore wind credentials. They combined touchscreen media centres with printed literature to provide information to read and take away. A semi private meeting area was designed to facilitate consultations and drive lead generation. 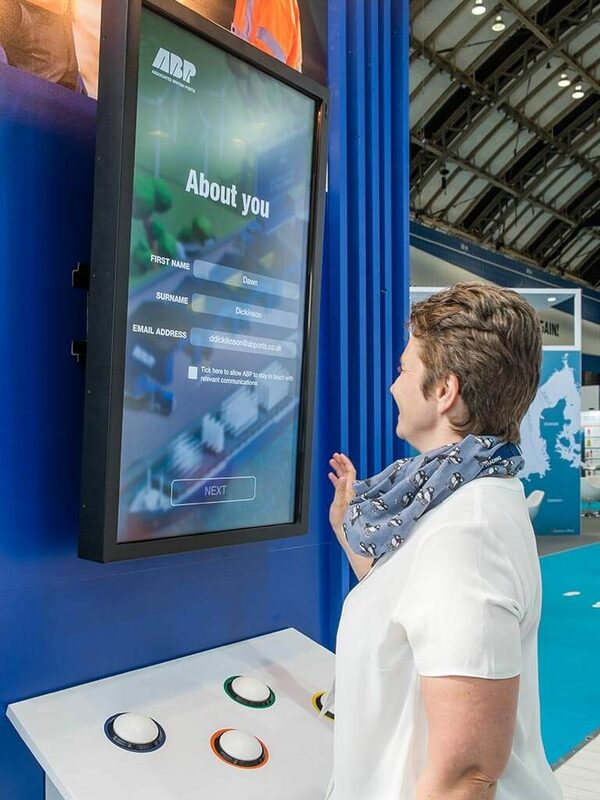 This time, engagement was created through a 3D digital Batak game to build wind turbines using physical coloured buttons to move each part ready for construction. Data capture was included in this game to help drive additional leads. Both shows utilised Nimlok’s exhibition stand analytics technology, monitoring how many unique visitors came to the stand, how many were engaged and their average dwell time. This provides another layer of insight into the stands performance, beyond data capture. 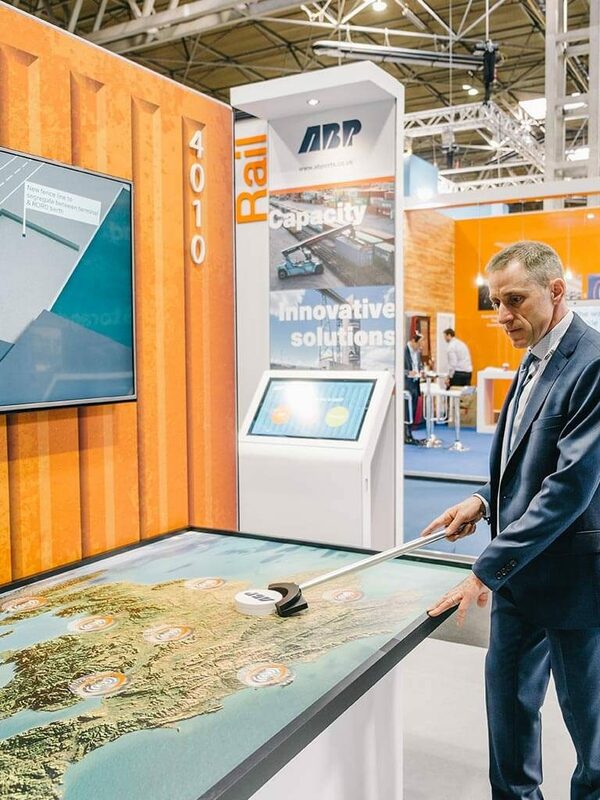 The container design at Multimodal drew an impressive 2757 unique visitors over the 3 days, with 47% of visitors engaged. The combined media centres, training simulator and proximity table helped to get an average dwell time of over 20 minutes. Global Offshore Wind saw 1702 unique visitors in 2 days, with 49% engaged. 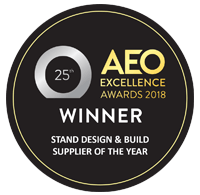 More than 100 people stayed on the stand for more than 30 minutes, with the engagement and stand design facilitating meaningful conversations and consultations.